Since breaking the news about The Grinder, we've been very interested to learn just a little bit more about the Wii's 4 player first person horror shooter, . Kotaku came to the rescue with many details straight from the developers, and some "visual hands-on" time with the game. We already mentioned that the developers, High Voltage Software worked on 4 player horror co-op with Hunter: The Reckoning. But, what does that mean for the Wii specifically? Comparisons have been made between The Grinder and fan favorites such as Left 4 Dead, House of the Dead: Overkill, and in movie form, Grindhouse. Since there are dynamic differences between each of these titles, it's important to point out that The Grinder is unique, while borrowing aspects from each and melding them to one nice tidy package. For instance, The Grinder has a specific story unlike Left 4 Dead. One of monsters taking over and the extermination that scorches many cities around the world. The setting takes place in the Southwest United States, with citizens demanding bounty hunters for hire, instead of firebombing their homes to deal with the situation. 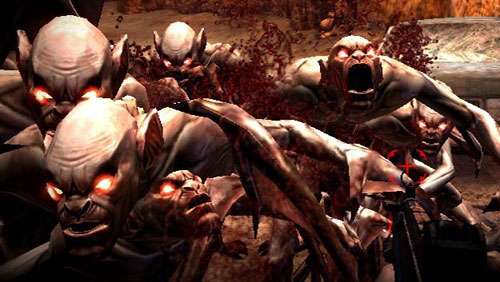 Unlike House of the Dead: Overkill, you will be absolutely swarmed with enemies on screen, making the most use of Co-op in a Wii game we've seen. There are also Werewolves, and we don't see those very often. While using The Conduit as a basic engine, The Grinder has already improved on it. Adding a bit of horror quirk with film crackle on screen the game looks phenomenal, and runs surprisingly well for the number of enemies on screen at once. Boasting up to 65 enemies on screen, the developers are working to balance the online play with these enemies for the smoothest experience possible. Characters are armed in a way that screams steampunk western, pistols blazing into a crowd of monsters, we're pleased with the direction this game is going. Wait, I mentioned monsters aside from the Werewolves, right? Where are my manners? "The enemies grow progressively harder as Matt progresses through the level, with hordes of vampires giving way to huge werewolves. One particularly fearsome creature was a large, humanoid stalker character that simply walks slowly towards you, soaking up bullets as if they were water. Your character is much faster than he is, but true to horror film conventions he teleports, so that just when you think you've lost him you turn around and there he is. You don't see him teleport - he's just there." Being called the "spiritual successor to Hunter: The Reckoning" should be encouraging, especially since the original developers are at the helm! Page created in 0.8903 seconds.